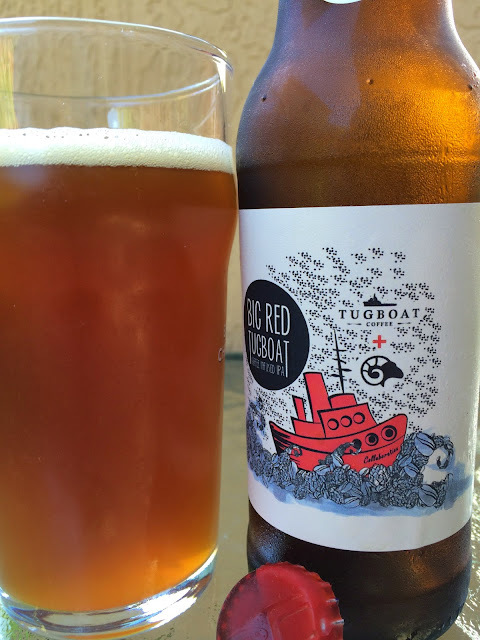 Chicago area Tugboat Coffee recently partnered with RAM Brewery to create their Big Red Tugboat Coffee Infused IPA for Chicago Craft Beer Week. Coffee IPA? Yep! Usually, coffee-flavored beers are porters and stouts, so this unique brew could be a new idea worth of notice! The artwork on the label is pretty fun. You really need to look 3 or 4 or 5 times to figure it all out. There is a red tugboat named Collaboration riding a stormy sea made of coffee beans and hop cones. The Tugboat name + RAM Brewery logo explain the collaboration. The cap is sealed with wax. 65 IBU. 6.2% alcohol. Big coffee aroma with tropical tangerine scents behind it, interesting. Um, interesting flavors too. Two totally competing entities: rich and quality coffee plus lemony grapefruity astringency. Honestly, I drink like 3 cups of crappy coffee every morning but do enjoy a quality cup now and then. And IPA is my style of choice. I had high hopes but see this as a marriage that will end in divorce after the couple sobers up. So clearly not something I enjoyed, but you gotta hand it to these guys for originality (and I hear they are trying to do some other creative new ideas too). Can't wait to try those out!